Flash & Glow Ball Jr. 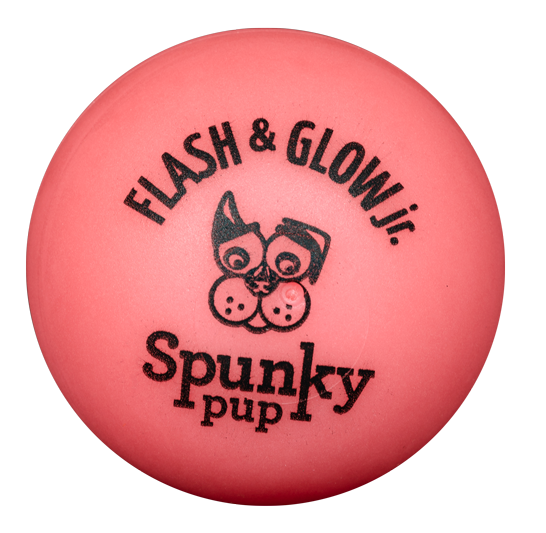 The Flashing Dog Ball for smaller dogs that Glows in the Dark, Flash & Glow Jr glows in the dark once exposed to light. But the real fun starts when you or your dog gives it a shake! Watch the light show as bright LED lights flash for 25 seconds to make this toy easy to find and fetch, even in the darkest environments. We designed the hard plastic exterior and internal components to stand up to whatever doggy playtime can dish out. It’s tough, easy to clean, non-toxic, waterproof and even floats. 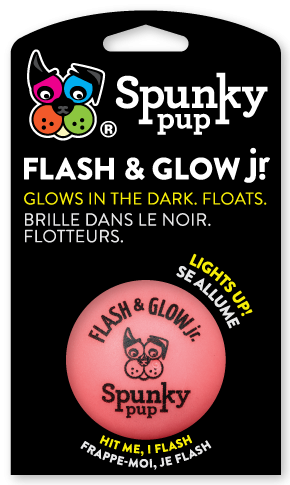 Flash & Glow Jr from Interactive Dog Toy is the best glowing, flashing, tail-wagging fun you and your dog can have. Available in fun assorted neon colors. 2 inches in diameter. Also see our soft Fetch & Glow and Fetch & Glow Jr.